For the woman who loves gazing into the deep blue of the sea or a mountain lake! This gorgeous blue flash labradorite is set in a sterling and fine silver setting that’s been hand-hammered to echo those rippling waters. Solid silver bubbles float around the amazing blue of this centerpiece. Pair with a casual outfit or make an unforgettable entry into your next soiree. 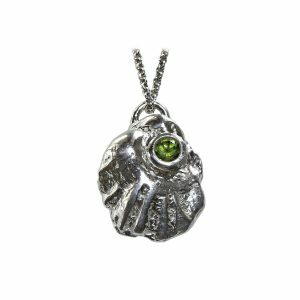 This pendant measures 1″ wide and 1-1/2″ long including the bail. 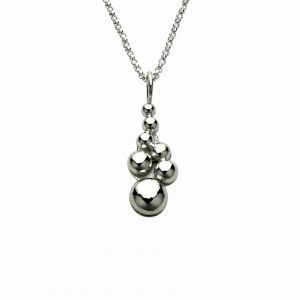 A sterling silver rolo style chain, in your choice of length, is included. Labradorite is a member of the feldspar family and is well known for its spectacular display of color, called labradoresence, which occurs as light enters the stones and reflects off its unique surfaces. It is named after its location of discovery on the Isle of Paul in Labrador, Canada.